Two more important columns have come out in response to Speaker-Designate Steve Crisafulli's op-ed and email and on the general issue of Common Core and testing. Although not really dealing with the issue of the tests coming as a result of Bush Family induced federal mandates and incentives, they, as we do, emphasize the issues of parental rights, loss of instructional time, and stifling of teachers over mandated tests. ...The "paid to advocate" crowd that pushes the idea of parental choice as it pertains to vouchers and charter schools is also the crowd pushing for more and more standardized testing in public schools. Their advocacy for their "parents know best what's right for their children" mantra applies to school choice, but is fiercely challenged when it comes to standardized testing. If Florida doesn't have the backbone to address the madness of too much high-stakes testing, it should allow local school boards to make the decision without bullying them or threatening their resources. Florida had led the nation in learning gains -- especially among poor and minority students -- since Bush's reforms introduced measurement and school accountability in 1998. The FCAT and school-grading system were neither perfect nor well-liked. But they gave educators a valuable tool and a motive to improve. We could have kept going with that. ...Enter Senate Bill 6 in 2010, a hallmark of that agenda. It would require high-stakes end-of-course exams in every subject. It based at least half of teachers' pay on student test scores. It ended job security by making teachers year-to-year employees. I'll never forget standing at a Tea Party rally at the Wickham Park pavilion in 2010 when radio host Bill Mick announced that then-Gov. Charlie Crist had just vetoed Senate Bill 6. The crowd erupted in applause. It saw SB 6 as big-government -- and too scary. ...SB 736 has made the prior decade under Jeb Bush's FCAT and "A-plus" school-grading system -- which most of us had come to respect -- look like a warm-up lap. It was meant to scare teachers, families and principals into improvement. It scared them all right. Now, three years later, an insurrection is brewing in conservative exurbs such as Brevard and Lee counties, the same places the Tea Party once propelled Scott to the governorship. The rebels are an unlikely political alliance of teachers, school boards and conservative activists opposed to any test that might be linked to Common Core standards. In Lee County, the school Board voted Tuesday to strike down the district's entire testing calendar, eliminating 68 tests from grades kindergarten through fifth grade, sanctions be damned. That followed a resolution by the Greater Florida Consortium of School Boards calling on the state to "suspend high stakes testing." If Scott and state Republican leaders think they can spin their way out of the uproar, they're wrong. Their intensification of testing and its consequences in 2011 broke a pain threshold for everyone. Tallahassee must carefully scale back testing now, or rebels will do it crudely at the polling place. Posted in Testing. Tagged as Charlie Crist, Jeb Bush, Matt Reed, Paula Dockery, Rick Scott, SB 736, Steve Crisafulli. "The child is not the mere creature of the state: those who nurture him and direct his destiny have the right coupled with the high duty to recognize and prepare him for additional obligations." The state and federal governments do not know better than parents. Florida needs to let public school parents and students have the same choice in testing as private and home schooled parents. Current Statutes Already Allow Parental Opt-Out or Alternatives - As outlined in my policy paper on testing, there are plenty of alternatives in statute for the mandatory tests that are required for promotion to fourth grade and graduation from high school. Crisafulli appears to contradict himself because in his email, he says that students won't graduate, but In the Florida Today op-ed says, "Even at these critical junctures, students have multiple opportunities and ways to demonstrate proficiency." He needs to decide which it is. The only place where things are ambiguous relate to state mandated End of Course exams other than Algebra I, which need an alternative test or portfolio option, or better yet to be eliminated. The Rights of Duly Elected School Boards in Florida The speaker-designate mentions the Florida constitutional duty for the state to provide a "high quality public school system." While true, he leaves out Article IX, section 4b which says, "The school board shall operate, control and supervise all free public schools within the school district and determine the rate of school district taxes within the limits prescribed herein." (Emphasis added). All of these state mandated standards and tests are a clear violation of this provision. Before the federal mandates of 1994, schools and districts were accountable to parents who could vote out board members, attend private schools, home school or move. They didn't have to be accountable to the state or federal governments. Increasing Federal Intrusion Crisafulli raises loss of federal funding as a concern. The word "education" appears nowhere in the U.S. Constitution. The Tenth Amendment to that document says "The powers not delegated to the United States by the Constitution, nor prohibited by it to the States, are reserved to the States respectively, or to the people." Our state should not be following these unconstitutional federal mandates to give academically unhelpful , invasive, expensive tests based on academically inferior, developmentally inappropriate and psychologically manipulative national standards. These tests are required under the unconstitutional No Child Left Behind Act and the illegal and unconstitutional, conditional waivers to NCLB. This federal standards and testing paradigm is making elected legislatures and county school boards almost irrelevant in setting education policy all for a mere two percent of the entire state budget or about just under seven per cent of the state education budget. The state gave up five times more than $1-1.5 billion to protect state sovereignty and its fiscal health from ongoing unfunded liabilities by giving up the Medicaid expansion for Obamacare. Florida needs to do in education what it did in health care. Utah Has Enacted a Parental Opt-Out Bill If Florida is not courageous enough to cut the strings on federal education funding, they should be encouraged that the State of Utah enacted legislation affirming parental control by allowing parents to opt out of tests without penalty to students, teachers and districts without danger, at least so far, to its NCLB waiver. The rebellion is building as evidenced by the Lee County vote to opt out of all standardized testing, even though they rescinded it, their new vote to clear the districts testing calendar, the Greater Florida Consortium of School Boards resolution to opt out of high stakes testing, the Florida School Boards Association similar pending resolution, the Gainesville kindergarten teacher's refusal to give standardized tests in kindergarten, and other efforts across the nation. There is much that Florida can do to regain sovereignty and autonomy, protect its children, and restore parental rights. It only needs the courage to do so. Two recent events show that parents, teachers and elected official are standing against academically unhelpful, developmentally inappropriate, psychologically invasive and expensive tests. That movement is spreading across the country, this time to Colorado. ...In a daring move, all seven board members gave a resounding "yes" at Wednesday's meeting, in favor of not giving all students the state tests Partnership of Assessment of Readiness for College and Careers (PARCC) and Colorado Measures of Academic Success (CMAS). "I know that i've heard from community members over the last several years, whether it be parents, whether it be teachers whether it be principals that we seem to test more than we teach," said Dr. Gledich. The resolution asks the State Board of Education to allow D-11 to only test a random selection of students with PARRC and CMAS during the next three years, enough to meet the federal minimums. Parents would be able to opt-out or opt-in their students for the tests, Dr. Gledich said. "I want my young kids to enjoy education and learning, I don't want them staring at a test for hours day, after day, after day," explained Denver mom, Kellie Conn. These parents hope that if D-11 can do it, the rest of the state will follow suit. "hopefully it will creep into Jefferson County, it will creep into Denver, it will creep into Littleton," said Conn. I am a teacher in the Aurora Public School District. I am writing to let you know that I will be refusing to administer the PARCC in the 2014-2015 school year. I do not stand alone in my refusal of this high-stakes test. I join the ranks of educators across the country who are fighting back against policies and mandates that ultimately harm our children and destroy our children's opportunities to become confident, active, problem solving citizens. I have watched the testing increase over my 18 years of teaching in the public schools. I have watched what it has done to my ability to meet children's needs and to allow children the opportunities to engage in learning that is authentic learning that furthers the purpose of these children's lives. This year, in particular, I am watching an onslaught of Common Core curriculum infiltrate our schools, along with additional tests and test prep to add to the test load which permeates every minute of every school day. I hear again and again that I should find the "good" in this curriculum and make the best of it. I am a literacy coach, therefore, I work with many teachers and children in our building. I believe our children deserve better than simply, my ability to find the "good" in this Common Core test prep curriculum. I believe our children deserve what President Obama's children have at Sidwell [Friends School in Washington D.C.], where teachers have autonomy to teach without scripted Common Core curriculum and common core high stakes testing. I take objection to the fact that our children are being used as guinea pigs in an experiment to implement standards which were never field tested, are copyrighted, were not created using a democratic process, and were not created with the serious input of classroom teachers. Furthermore, the Common Core standards have placed unrealistic expectations on our youngest learners, many who now view themselves as failures because they are unable to meet the developmentally inappropriate expectations set by the Common Core standards. I also refuse to administer the PARCC because I believe that participation in such testing gives the test credibility of which it has none. The PARCC test was designed to assess the Common Core standards, which are not grounded in research, nor are they internationally benchmarked. Furthermore, there is no evidence that the Common Core standards, Common Core curriculum and Common Core testing, will in any way close the achievement gap. It will do the opposite... (Emphasis added). Public officials like Governor Scott, those in the legislature, and Jeb Bush as he decides whether or not to run for president, need to know that teachers, parents, and elected school boards will not sacrifice their children and their futures to political and corporate opportunists bent on controlling the lives of our children and making billions of dollars via these tests. Posted in Testing. Tagged as Colorado, D11, Peggy Roberts, Susan Bowles. This is another example, like Dr. Effrem's report on the radicalized AP US History framework, of how the teaching and testing of Common Core is destroying and rewriting our nation's history and heritage and it must be stopped. Interestingly, Bush does not castigate Common Core critics for peddling misinformation about the state-developed standards. Instead he invokes a theme conservatives find familiar: "The principal reason [for the fight] has been the president. There is no trust he will faithfully enforce the law." He points to the administration's conditioning No Child Left Behind waivers on adoption of Common Core or equivalent standards, a practice driven not by legislation but by executive whim. "I respect the frustration. But those who oppose Common Core need to finish the sentence. 'I oppose Common Core ... but I want high expectations for my child, for my schools." COMMENT: Mr. Bush is correct that the conditional waivers are illegal and unconstitutional. However, he totally misses the point that the federal interference in education that started under his father, George HW Bush that led to federally required state standards and tests in 1994 and the expansion of yearly tests in 2001 under his brother George W. Bush have led to these problems with the illegal waivers requiring Common Core trying to deal with terribly unconstitutional legislation in the first place. Bush ticks off the list of must-haves in education beginning with "higher standards" and without invoking Common Core specifically. He goes down the list: "Accurate testing, shifting to teacher effectiveness and being able to fire bad teachers, school choice, embrace digital learning. We know these have yielded great results." COMMENT: None of these things are "must haves." The testing mania/accountability requiring teachers teach to the test and students spend so much time testing instead of learning is quite harmful and is sparking a rebellion all over the country, and especially in his home state of Florida. School choice laws are being written to impose public school (Common Core) tests on private schools. And, digital learning is resulting in massive data gathering, psychological profiling and indoctrination without parental knowledge or consent, not to mention the potential physical harm of so much electronics exposure at young ages. Bush is starting to be challenged in polls such as the one in Florida that showed Senator Rand Paul ahead of him against Hillary Clinton in Florida and the newest one in New Hampshire showing him also behind Paul. According to the Wall Street Journal, Bush's aids are trying to prevent donors from looking at other candidates. All of this indicates continued issues with a potential Bush presidential run. "I don't want the federal government to run our education system. So here's what we've done. About a year ago we opted out of PARCC, which is the national assessment test." COMMENT He then opted the state into AIR, which is developing tests for the other national assessment, SBAC; has been involved with the federal government in data collection and other ways for years; admits Common Core is a national curriculum; is a behavioral and social engineering research organization; and promotes social and emotional learning and other controversial topics over academics. (See details). "We said the federal government is not going to be data mining our students." COMMENT This is particularly hard to swallow. Scott and the Legislature doubled down on linking Florida's data statutes to FERPA (The Family Educational Rights and Privacy Act), the dysfunctional federal privacy law gutted by the Obama administration and containing an entire section of regulations on collecting student data without parental consent. (See analysis). In addition, AIR, chosen by Scott's education commissioner for Florida's state Common Core test, is closely tied to the federal government and student data collection through its Center of the Analysis of Longitudinal Education Research (CALDER), even admitting that it is involved in mining the data of individual Florida students and teachers. "...So we have Florida standards." COMMENT - As we have extensively documented, many officials in the Florida Department of Education, Speaker Weatherford, and countless state and national media outlets have stated the truth changing 98 out of 11,000 (0.9%) standards and removing the name from statute does not produce real Florida standards. Florida is still teaching the Common Core standards. "The Lee County School Board did the right thing when they changed their mind. They have to look at the unintended consequences of their decision. You know, when they made those decisions, what is it going to do to their students? Are they going to be able to get into the best universities? Are they going to lose federal funding?..." COMMENT The statement regarding universities is just absolutely incorrect. There are alternatives in statute allowing students to take other tests besides the state mandated tests, and private and homeschooled students get into top universities all the time without taking those tests. And with regard to federal funding, if he really meant that he doesn't "want the federal government to interfere in our education system," why doesn't he assert the state and local sovereignty afforded Florida via the Tenth Amendment and afforded the districts via Article IX, Section 4b of the Florida Constitution the way it was done with the Medicaid expansion under the Affordable Care Act? 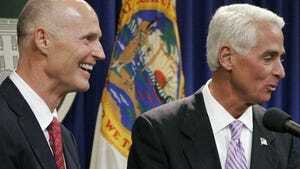 Governor Scott remains locked in a very tight re-election race with Charlie Crist. After spending $25 million on negative ads, the governor is ahead by about two percent which is still within the margin of error in the Real Clear Politics average. A weak attempt to mollify Common Core critics by promising a review commission sometime in the distant future one day before the primary did not prevent him from losing 117,257 votes to two unknown, very underfinanced primary opponents, at least one of which opposed Common Core. This was more votes than his margin of victory in 2010. The governor continues to sacrifice the sovereignty of the state, the legislature, and school districts to the federal government and to alienate the base that elected him on a very important issue at his own political peril. Posted in Political Aspects of Common Core. Tagged as Common Core, Governor Rick Scott, Lee County, state tests.